2016 NYC Trip Photos #7: Manhattan Mealtimes « Midlife Crisis Crossover! Our Day Two lunchtime architect panicked at the idea of being on camera, but graciously invited us to photograph his workspace where the magic happens. 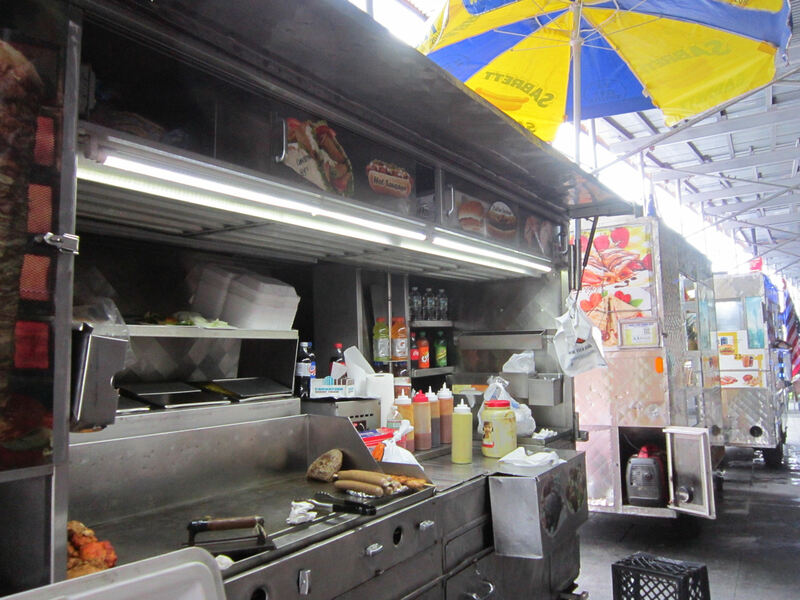 Upon our return to Manhattan we hoped for interesting adventures in the fabulous field of food. Results varied more than we expected as we did our best to accommodate all tastes and hopes within our little trio — sometimes venturing into businesses unknown, occasionally settling for familiar logos for the sake of party unity. We learned that independent ownership is no guarantee of a successful meal, nor is corporate franchising presumptive of automatic culinary failure. For an early lunch on Day Two, we decided we’d wing it and see what we found in the World Trade Center vicinity. 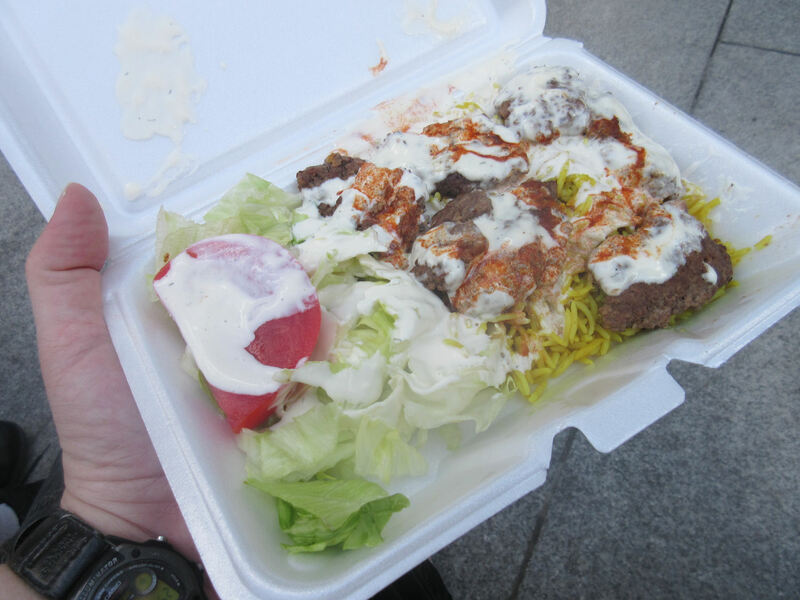 Rather than spend twenty minutes clicking on Google Maps results and putting candidates to a vote, we jumped headfirst into the NYC streetside experience and got lunch from one of the many halal carts that migrate and line up all around the city. Those kind gents thankfully eased my bagel sandwich withdrawal pains. While my son enjoyed a pair of chicken kebabs, I had a heaping helping of kefte, kefta, or kofta, whichever your preferred spelling is. Basically, upgraded meatloaf in a spiced-up cream sauce. I approved. 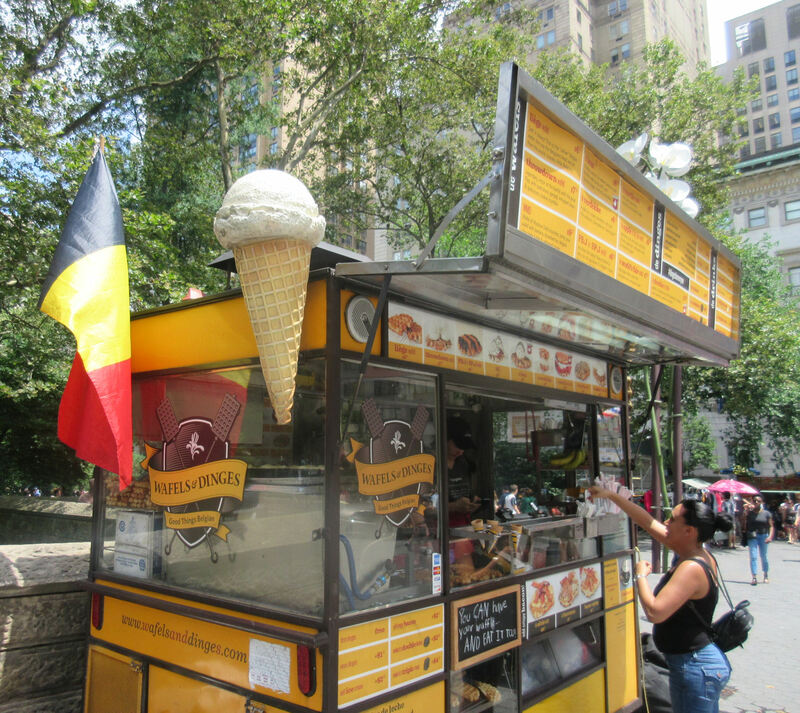 At the starting line of our 22-block march through Central Park was a food cart called Wafels & Dinges, which served a variety of ice cream dishes and waffle-based treats. My wife and son were pleased to stumble upon their lifesaving snacks at exactly the right moment, after we’d already been traipsing around the city for a few hours and needed a recharge. I’m told the ice cream was yummy but melted quickly in the July heat. I had to abstain because I was still overstuffed with kefte or kafto or whatever. 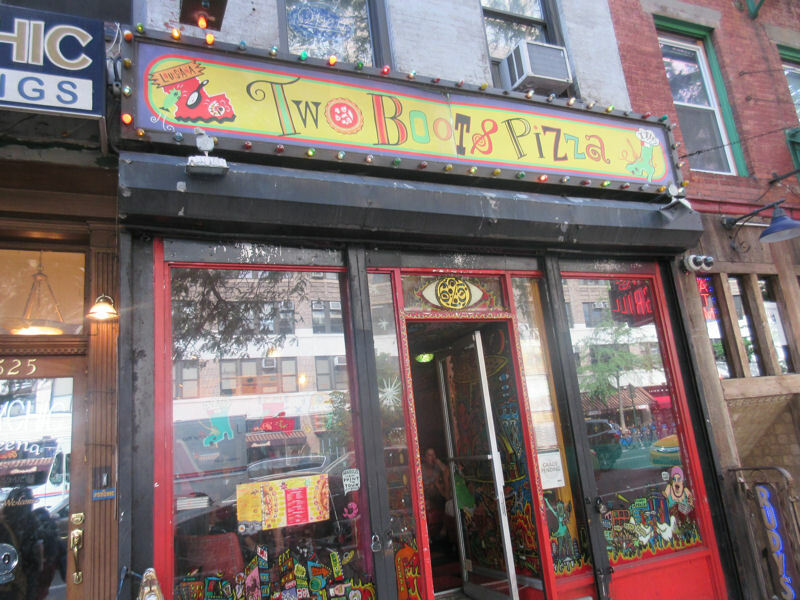 When we returned to the Hell’s Kitchen area after Central Park, we let Google Maps pick our next stop, which led us a bit west to the doorstep of Two Boots Pizza, a company that began in 1987 in New York’s East Village but now has locations in five other states. Sure, we could’ve gone to Famous Original Ray’s, or Original Famous Ray’s, or Unique Superstar Ray’s or Infamous Derivative Ray’s, or the nearest Pizza Hut. But that’s not where Google Maps led us. 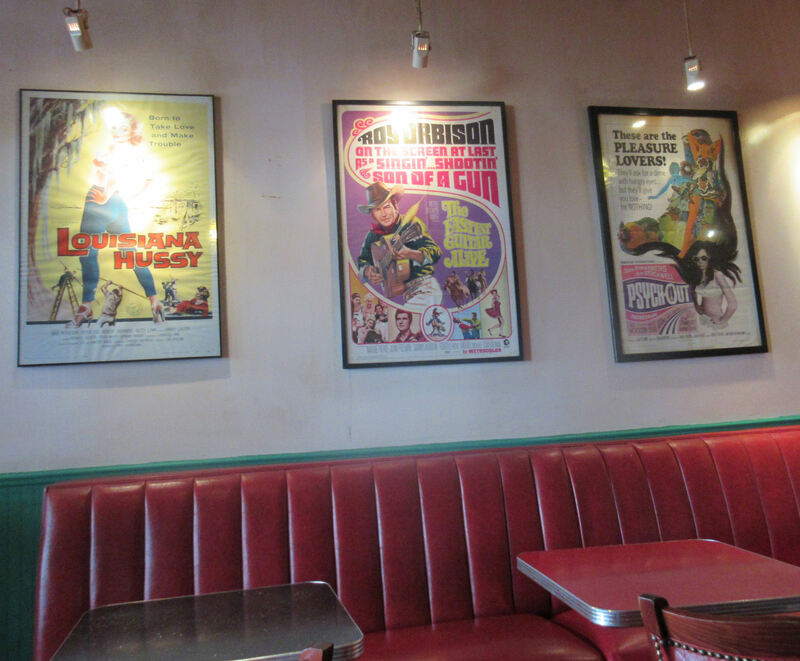 …and their pizza options are named after famous movie characters in a frequently rotating assortment. As I recall, our dinners included the likes of Mr. Pink (Creole chicken, plum tomatoes, fresh garlic, mozzarella), Newman (sopressata, sweet Italian sausage, white sauce), and…I forget who/what else. Pretend this is an Expresssionist artist’s rendition and not a hurried photo. The gimmick lured us in, but it was the pizza quality that ultimately turned us off. Nothing personal against thin crust pizza, but ours were dry and the undersides were blackened. Not sure if that’s Cajun intentionality or food quality control issues on a Sunday evening in the Kitchen. We were unanimous in dissatisfaction. 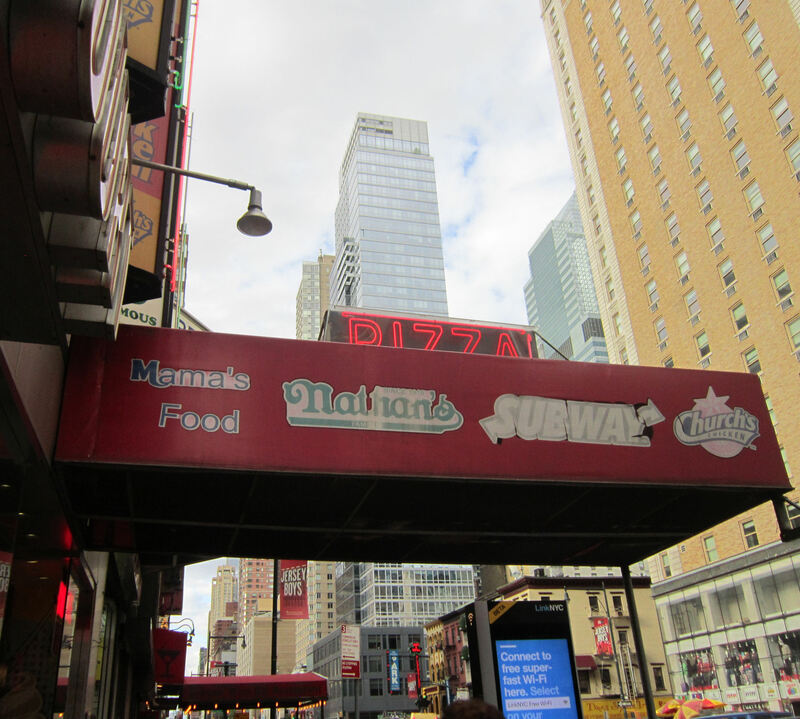 My son refused the inedible portions and was still starving when we exited, so we walked over to 8th Avenue for a runner-up on his behalf at a miniature food court combining Mama’s Pizza, Subway, Nathan’s Hot Dogs, Church’s Chicken, and one of the eight remaining Arthur Treacher’s locations in America. Most of these are familiar names. We had an Arthur Treacher’s not far from my childhood home, a Church’s opened near our house last year, and close friends know Subway is my longtime nemesis. While I kept venturing out for donuts and other morning snacks, and Anne contented herself with free hotel breakfast every day, the Mama’s court would become my son’s home away from home for the rest of the week. 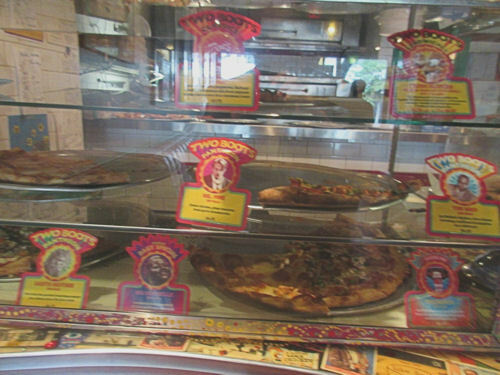 Mama’s, we found, was not unlike your standard fast-pizza chains like Enzo Pizza, Luca Pizza, and other companies you’ll find in shopping and strip malls nationwide. For our money the flavor, texture, and overall quality were right in line with those companies’. That’s a roundabout way of saying we liked it much better than the previous pizza attempt. Maybe this means we’re everything that’s wrong with New York City tourism, but that’s how the two back-to-back dinners stacked up against each other. If it helps, Day Two wouldn’t be our last attempt at finding authentic New York pizza, which we’re told is a thing that exists and should be mandatory. 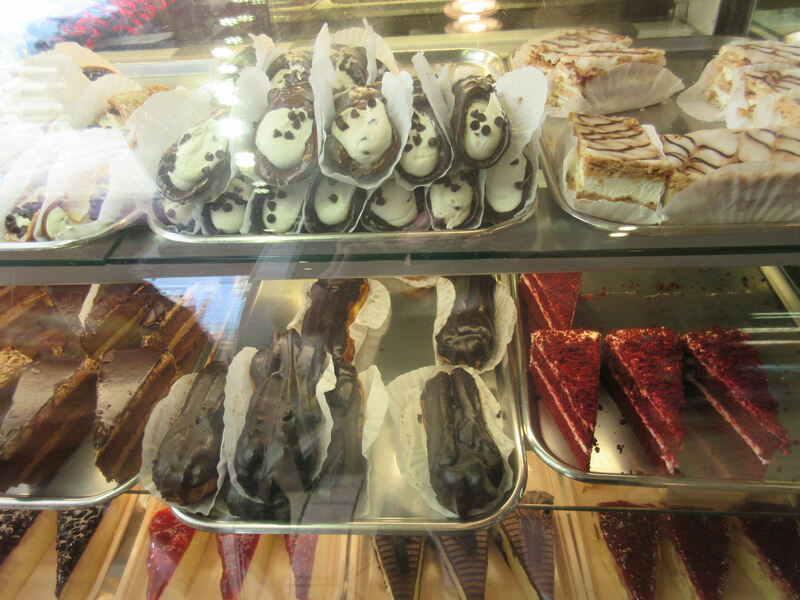 Pizza aside, Mama’s won us over on desserts, too. So many exactingly pretty forms of sugar and other sinful carbs. Maybe they’re handcrafted, or maybe they arrive looking like this on the Mama’s delivery trucks directly from the Mama’s factories. Couldn’t tell you, but they went a long way toward assuaging the pain and exhaustion from our miles of walking that Sunday. This, far as we were concerned, was the right way to conclude Day Two. Cheesecake! Cannoli! Chocolate in general! God bless you, New York City.